The College Tab: Who Pays for What? The majority of families end up borrowing for college. But when parents and teenagers talk about how they are going to divide up that responsibility, they rarely possess a good idea of what this debt burden is going to mean for them when the bills come due. That’s why I’m recommending a tool from SimpleTuition, an aggregator of private student loans, that allows families to anticipate what the borrowing costs will be in the future for the student and the parents. The tool is called the College Cost Adjuster. You have to register on the site to use it, but I think it’s worth it. To use the College Cost Adjuster, simply type in the name of a university and SimpleTuition will automatically fill in the average cost of attendance of the institution. You will see a variety of ways to pay for the school listed including savings, scholarships, parent loans, home equity loan, work-study, private student loans and federal student loans. To illustrate what the tool can do, I’m using Ithaca College as an example. The tool automatically provided the cost of Ithaca’s attendance and the average grant that a student attending Ithaca receives – $19,199. It also provided the maximum federal student loans the hypothetical student could receive. I filled in the rest, including what the parents could pay in cash for one year of college. What I really like is the tool’s monthly payment adjuster. You can move the slider bar to adjust what percentage of the debt burden will be assumed by the parents and the child. When you move the bar you can see the consequences of the change of the debt distribution and the sources of college funds will automatically adjust in real-time. Students can also view an estimate of the salary they will need to make to meet the expected payments for all student loans, which can be very sobering. To see what kind of costs you face in the future you can use a one-year debt figure or a four-year figure. In the example, I used the one-year figure, but four-year statistics are the meaningful ones. Using the College Cost Adjuster can lead to better financial decisions. And sometimes the best decision will be forgetting about a school that’s going to cost too much. 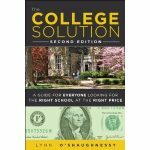 You can now order a copy of The College Solution, 2nd edition. I just finished writing the 2nd edition of my book – I’m getting ready to proof the galleys – and it’s now available on Amazon for preorders for just $12.61 – a 47% discount off the stick price. Ninety percent of the content is new and I am more proud of this book than anything I’ve ever written. How’s that for an endorsement, even if it’s coming from me!